By now you know it's true. 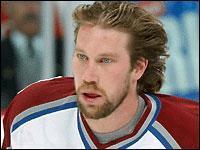 The Flyers have signed free-agent Peter Forsberg to a two-year contract. The terms have not been announced, but it looks like somewhere between $11 million and $12 million. The rumors of Jeremy Roenick being dealt to Los Angeles were a bit premature. The Flyers have said a deal has not been completed, but it is still expected. It could be Phoenix, rather than Los Angeles. Forsberg, generally regarded as the best player in the world, has gotten Flyers' nation all excited. That's one way to make fans forget about the lockout and the lost season. From jammer2 on the Philly.com Flyers discussion board: "all true...seen it on a few stations that have confirmed it all...the signing for 2 years of Forsburg and the trade of J.R. .....this is great .....beyond great...dancing around the living room on cloud nine..."
From neilpeart: "I just saw the official announcment. We must parlay this into a championship. Boy, will that make the pain of no hockey for a whole year go away." From flyercanuck: "This is EFFIN great!!!WAHOO!! Stanley, come to papa!!!" From NTP66: "There's only one thing for certain: I'm breaking out the plastic and buying season tickets tomorrow!" Finally indeed. This is huge. Where in the world is Bobby Abreu?